The NZ Children’s Social Health Monitor update has been released and the politicians have said their piece. Here are their words as paraphrased in our notes at a recent forum; (we hope they are a fair representation). Annette King (Labour): ‘Need universal approach for all children as a basis, cross party agreement and a senior Minister for children.’ Suggests child health impact assessment for all new policies. It’s not surprising the medical association is worried about costs of ill health. The annual cost of child poverty is around $8 billion according to John Pearce’s report for Analytica. The total cost of child ill-health from poverty is between $1.1 billion- $2.4 billion or 0.6% to 1.4% of GDP. Want to help reduce income inequality right now? Go to http://www.closertogether.org.nz/ and follow the instructions. What’s not in it: The Bill still permits: alcohol advertising and sponsorship; ultra-cheap alcohol sales, the current alcohol driving limit; and alcohol sales in supermarkets. Doug Sellman from Alcohol Action New Zealand calls the Bill ‘shamefully weak’ and says ‘it abandons alcohol control to local communities’. VicHealth (Melbourne) has put together some work on what can help us live better via better housing. The list includes: ‘address the overall lack of adequate supply of affordable housing; reduce homelessness through an effective support system and increased housing options; improve ‘housing hardware’ – for example, standards to ensure adequate insulation and draught prevention in low-cost private rental housing; family support programs to ensure that family heads are able to adequately control their housing space and visitors receive support to access alternative housing options’ More. Peter Dunne mentioned it in at a recent Hui on child wellbeing; Annette King suggested schools could be used as hubs. Meantime it’s happening in Christchurch out of necessity and in Auckland becasue it has been deliberately created. The one- stop-social –service- shop. Te Whanau o Waipareira Trust is providing a whānau house in Henderson. Families can access more than 70 services at the centre including primary health care in the GP clinic, dental and pharmacy and well as a range of ‘secondary services’ offered by the Waitemata District Health Board. More. Want to be an expert on responding to the Green Paper? A reading list – just for you. Test next Policy Watch. Asher, I. (2011, June 27). Letter to Members of Ministerial Group on Welfare Reforms. Auckland. Council of Australian Governments. (2009). National Framework for Protecting Australia's Children 2009-2020. Canberra: Commonwealth of Australia. Eckersley R et al. (2006). Flashpoints and signposts:pathways for success and wellbeing for Australia's young people. Melbourne: VicHealth. Infometrics. (2011). 1000 days to get it right for every child: the effectivenees of public investment in New Zealand children. Wellington: Every Child Counts. Marmot, M. (2010). Fair society healthy lives:Strategic review of health inequalities in England post 2010 (Marmot Review). Department of Health, U.K.
New Zealand Government. (2011). Every child thrives, belongs, achieves: the Green Paper for Vulnerable Children. Wellington: New Zealand Government. New Zealand Medical Association. (2011). Health Equity Position Statement. Perry, B. (2011). Household incomes in New Zealand: Trends in indicators of inequality and hardship 1982 to 2010. Wellington: Ministry of Social Development. Prime Minister's Chief Science Advisor. (2011). Improving the transition: reducing the social and psychological morbidity during adolescence. Wellington: Office of the Prime Minister's Science Advisory Committee (Gluckman report). Public Health Advisory Committee. (2010). The best start in life: achieving effective action on child health and wellbeing. Wellington: Minstry of Health. Scottish Government. (2008). The Early Years Framework. Edinburgh. 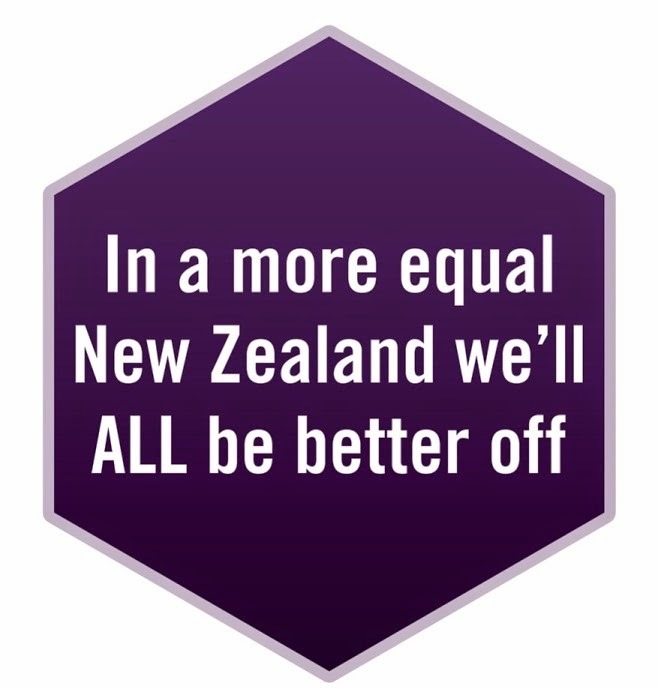 The widening pay gap the "moral question of our time"
Helen Kelly CTU President has referred to the pay gap as the moral issue of our time. Some CEOs are paid up 50 times as much as their average employees. Last year, the average CEO’s pay was around 18 times of the average worker; nine years ago the rate was 15.2 times. Telecom is about starting to look for a new CEO. Policy Watchers who might want to apply can consider if a package of around $4.7 million is enough for them. How to deal with the employment problem – an in-depth article by Keith Rankin . As Moderator of Te Aka Puaho I send this email to you in regards to Turakina Maori Girls College. For over 100 years Te Aka Puaho has supported TMGC as this is our only Boarding school. … Recruitment of students is always an important matter, may I ask all Ministers, … to constantly promote Turakina Maori Girls College as a viable option for educating and developing the potential of our young Maori girls. I would like to ask all our Ministers, Elders, Leaders and Parishes if it is possible to have … Sunday25th of September every year be set aside in our church calendar as Turakina Maori Girls College Day. … To those outside of Te Aka Puaho, perhaps you may like to join us on this Sunday and simple make mention of TMGC in your service with a prayer for our school and maybe a special donation to the school … Finally. as Moderator I would like to ask that you circulate this email to all church members, friends and contacts that you may have in church, community and work as a way of promoting our school, Turakina Maori Girls College. Arohanui, Rev Wayne Te Kaawa, Moderator of Te Aka Puaho, the Maori Synod of the Presbyterian Church of Aotearoa New Zealand. Thriving - A resource was produced in collaboration with Auckland Women’s Centre, THRIVE Teen Parent Support Trust, Te Waipuna Puawai, Anglican Trust for Women and Children, Know Your Neighbours, Lifewise, and Takapuna Methodist Church 2011.It comprises an ‘action inquiry,’ to learn more about a family whānau centred approach.